There’s little more frustrating to me than being forced to slog through--instead of devouring or cherishing---a novel because of external forces: work, family, sleep, looming library fines. I started The Inheritors no less than four times, and after repeated renewals at the library, I was forced to read it in only two sittings. A shame really. Though short, the novel is deliberately paced, thoughtful, and thought provoking. It’s meant to stay with you, the literary peanut butter stuck to the roof of your mouth--delicious, yet troublesome. Alas, while I did finish the book, it was not my finest hour as a reader. 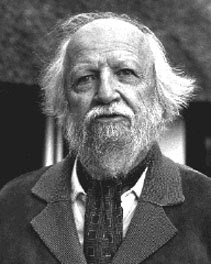 Sir William Gerald Golding (1911-1993) is not known as a sf writer, and this novel is rarely, if ever, billed as a piece of science fiction (it’s definitely a speculative fiction book, however!). But that’s the way Pringle wants it to be known. And in terms of this list, what Pringle wants Pringle gets. And why shouldn’t he? As per the quote above, the novel, as any good sf novel does, stems from scientific knowledge and exploration. It’s a book about the last days of the Neanderthals for goodness sake. 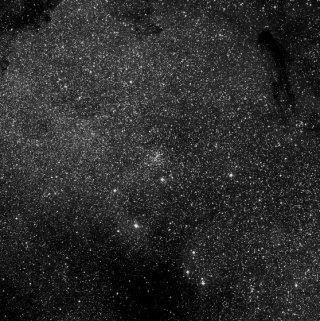 And as Arthur Clarke sees it, progress and science run from the bone in the hand of primitive man to the starship in the sky. The narrative is simple. A small group of Neanderthals returns to their seasonal cave to find their world adjusted. The log they use as a bridge to cross the river is gone and food is unusually difficult to procure. Quickly they realize there are others in the area. Beings both familiar and utterly foreign. Members of the clan begin to disappear (i.e., are murdered). Soon after, their leader dies from an illness, and all that is left is a male and female pair, Lok and Fa. They track down these others in hopes of finding their young one, Liku, and discover that these others are the inheritors of the Earth. They’re homo sapiens. Lok isn’t particularly bright, and he’s not cut out for leadership. Fa is naïve. The two of them, as is to be expected from the naturally peaceful, childlike Neanderthals (if we are to believe Golding), can’t quite conceive of what’s going on. Why would the others kill? Why do they wear the skins of animals? How do they ride in logs (canoes)? Particularly perplexing to the pair is the matriarchal-animistic religious rites of the others. Anyway, I’m sure you see where this is going, yes? In the end, only one is left. One to cry in frustration over what is no more and to watch helplessly (the Neanderthals can’t even cross the river because of their fears) as the species dies out and the rule of the inheritors begins. Though I must say, for all their superior intelligence, the homo sapiens are equally perplexed by the Neanderthals. 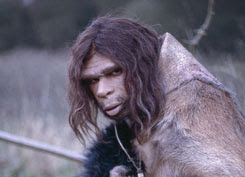 The real reason for the slaughter…they feared the Neanderthals were devils. 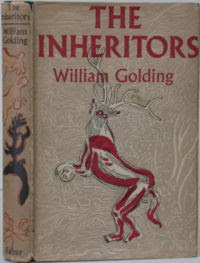 The Inheritors is Golding’s second novel. His first is the beloved Lord of the Flies, and there are certainly some thematic similarities between the two: clan identity, ruthless humanity, and the corrupting nature of power and leadership. Golding’s version of the world is pitiful. The hungry aren’t filled. The meek don’t inherit the Earth. And the merciful find only mercilessness. 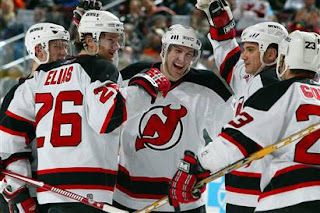 New Jersey Devils. Nice touch.